Japan has a long history of suicide. 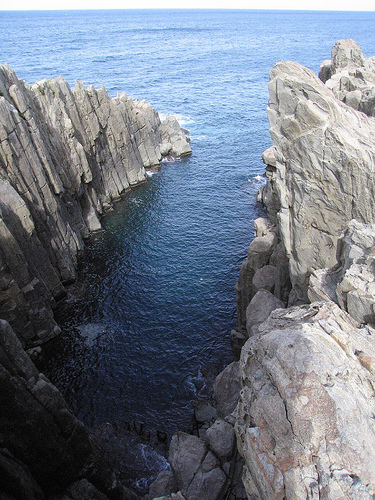 And nowhere is this cultural phenomenon felt more keenly than at the cliffs of Tojimbo, a popular tourist destination, on Japan’s western coast. This scenic and treacherous spot has the grim distinction as being one of the best known places to kill oneself in Japan. Japan’s suicide rate is an astonishing three times higher than that of the U.S. In 2003, a record 34,427 people committed suicide in Japan and this year is on track to approach that number. Due to the global financial crisis and Japan’s long economic decline, suicide has become an “honorable” solution in a place where depression is little discussed and very rarely addressed. But there is one man who is trying to change all this, at least in his small (but arguably large) way. He is Yukio Shige, a retired policeman who has dedicated his days to trying to prevent people from jumping off Tojimbo’s cliffs. Mr. Shige has also organized over 70 volunteers who also help him patrol the cliffs, looking for the loners. Read the NYTimes article linked above for a profile of this good Samaritan. I am truly in awe of his dedication to this mission. It is an amazing testament to the resolve of one man, determined to save lives, one conversation at a time. If I had a hero, Mr. Shige would be it. Posted by Kim in Suicide and tagged Japan. Bookmark the permalink.